Let the paperwars begin - fountainfeders Webseite! I am brand new to the whole blog world and actually don't no much about it all. However I think it is a summary of crazy things that happen. Since our journey of Fountainfeder started not even two months ago we had some amazing times. We are awaiting an order of Robert Oster from Australia with a bunch of new colours. 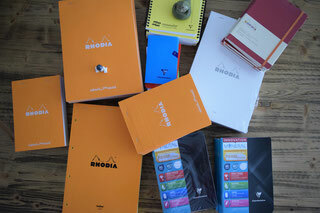 Today we received an order from Rhodia and Clairefontaine which was so exiting. Since we are not just buying stuff for good, we also had some orders, which is still a party everytime one gets in. The super5 month is just around the corner and all preperations for it are done. It is always hard to calculate the weight of all products, best packaging and shipping to be able to offer great value bundles for the month. This month I think we realy nailde it however. I am realy exited about the pens and inks. I do hope this journey will go on and on for some more time and will just be as wonderful as it is now.